Henry Murger's tales are a far cry from the soaring romanticism of Puccini's opera. In the mid-1840s Henry Murger (1822–61) was living in poverty in the Latin Quarter of Paris. No one wanted his verses or dramas, and his only earnings came from hack journalism. His friend Jules Fleury told him that there was a market for contemporary stories about the lives and loves of struggling young artists. Murger therefore decided to write about his own experiences and between 1847 and 1849 published some twenty-three tales of bohemian life. Murger might have been surprised to see his fiction become the inspiration for Puccini's La bohème, often termed ‘the most romantic of all operas’. Murger's stories are far from romantic – the dominant tone is cheerful satire. He has great fun mocking the appearances and artistic aspirations of his four bohemians. 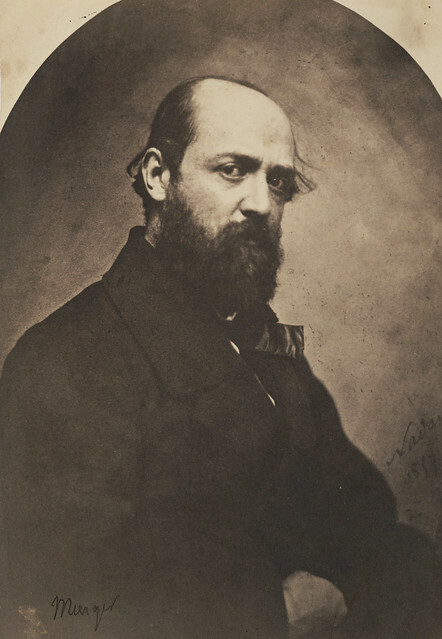 The poet Rodolphe, based on Murger himself, is ‘a young man whose face could hardly be seen for a huge… many-coloured beard’ with a ‘premature baldness that had stripped his temples as bare as a knee’. The burly painter Marcel has submitted his Crossing of the Red Sea to the Louvre so often that ‘if it had been put on wheels it could have gone by itself’; it ends up as a grocer’s shop sign. The musician and painter Schaunard has a voice ‘like a hunting horn’, a nose ‘aquiline in profile and snub in full face’ and is endlessly revising a symphony named On the Influence of Blue in the Arts. The bibliophile philosopher Colline has a mouth that ‘looked as if it had been drawn by an elementary art student whose elbow had been jogged’, and is perpetually in quest of a publisher but never getting published. For all their dreams, none of the men work particularly hard, and they are singularly useless with money. Whenever one of them earns anything, all four down tools to enjoy Pantagruelian banquets until they are poor again. In one story, ‘The Waters of Pactolus’, Rodolphe earns 500 francs and declares that he and Marcel will practise ‘strict economy’. This includes dining out lavishly (to save the cost of supper) and hiring a manservant (to give them more time to work). Needless to say, the money has gone within a month. None of Murger’s four friends are particularly successful as lovers. Marcel and Musette are genuinely devoted to each other, but Musette’s love of luxury leads her regularly to leave Marcel for wealthier men. Rodolphe has several lovers. His relationship with Mimi (based on Murger’s own mistress Lucile Louvet) is largely unhappy. Mimi, whose face ‘could assume an appearance of savage brutality’, feels only ‘the lukewarm attraction of habit’ for Rodolphe. She drives him to distraction with her temper and coquetry, and eventually leaves him for a viscount. Only rarely does Murger strike a note of romantic tragedy. A story seemingly unrelated to the others, ‘Francine’s Muff’, describes the love affair between a talented sculptor, Jacques, and a seamstress, Francine. Jacques and Francine meet by chance one evening. They live blissfully together for several months, but Francine suffers from consumption and dies at the end of the autumn. Her final wish, granted by Jacques, is for a muff for her cold hands. Jacques subsequently dies of grief. Puccini and his librettists Giacosa and Illica drew as heavily on Murger’s Francine as on his Mimi when creating the character of Mimì in La bohème. Jerrold Seigel describes Henry Murger as ‘a mediocre writer and in some ways a not very admirable person’. This is perhaps unfair. Murger was sometimes observant, and could be very funny, but he was uneasy outside the realm of satire. 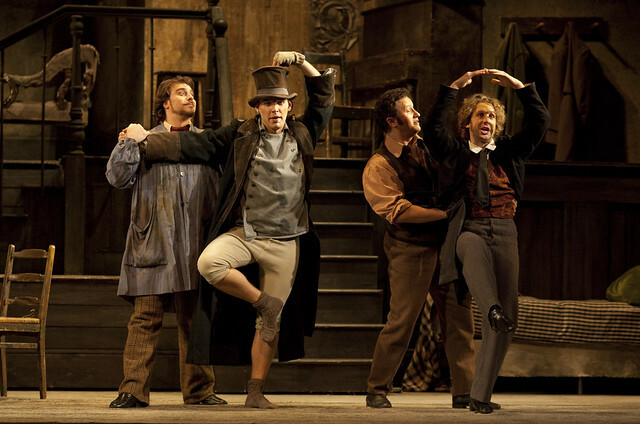 Puccini and his librettists, all skilled men of the theatre, realized that for La bohème to be a success the audience must sympathize with the main characters. They gave the two couples in the opera, particularly Rodolfo and Mimì, articulacy, enthusiasm and a capacity for strong feeling. While maintaining some of Murger’s wry humour and sharp portrayals of Paris life, they added an element lacking in his stories and plays: tenderness. This is an extract from Kate Hopkins's article 'From Satire to Romantic Tragedy', which can be found in full in the red programme that accompanies The Royal Opera's production, available from Front of House staff during the performances and from the ROH Shop. La bohème runs 9–19 July 2014. Tickets are still available. The performance on 15 July 2014 will be streamed live to free, outdoor venues around the UK as part of BP Big Screens. Find a screening near you. The production is given with generous philanthropic support from The Royal Opera House Endowment Fund. Original Production (1974) supported by The Linbury Trust.